Barbecue season has finally arrived! In preparation, I have made a double batch of my favorite rub. It's great on pork and chicken and I'm thinking I'll use it next time I grill some salmon. 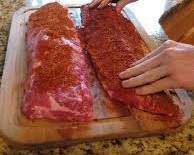 Just rub it on whatever you are planning to grill an hour or two ahead of time to let the flavors seep in. Grill until almost done and baste with your favorite sauce.